Includes a 1-ride lift ticket, when available. Start enjoying Spring and Summer skiing! For one thing, buttery soft summer ski turns are the best way to get down the mountain. 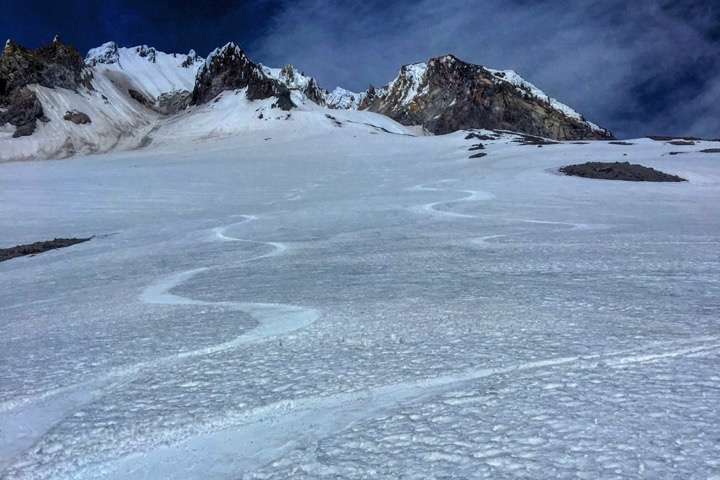 For another, Mount Hood has some of the best most accessible glacier skiing and ski mountaineering terrain of any place in the lower 48 states. That’s the reason ski teams from around the world come to train on the summer slopes below the Palmer chairlift. Our program takes you above the lift, where features like Illumination Saddle, the White River Headwall, the West Crater Rim, and the Reid Glacier are transformed into ski runs. Glacier skiing provides an experience on parts of the mountain you haven’t seen up close on many climbing trips. First thing in the morning, we’ll take the Magic Mile and the Palmer chairlifts to 8,500. Then we’ll slap on our skins and get some elevation gain for our warm-up lap. We’ll feel out the snow conditions, assess the weather, and head for our main objective for the day. Glacier skiing tests your skiing ability alongside your mountain skills. Solid skiing movement is required. However, your guide is able to teach you a range of skills, from basic use of skins and avalanche equipment to advanced glacier-travel, and steep skiing concepts. Your guide will tailor the program and terrain choices to your skills and interests. This course is a great introduction to advanced ski touring in glaciated terrain, and can challenge skiers of all levels. Glacier skiing can range from simple to complex, and runs can range from intermediate to expert. Solid ski movement and comfort off-piste is required, but our guides will tailor the program and terrain choices to your skills and interests. This course is a great introduction to advanced ski touring in glaciated terrain, and can challenge skiers of all levels. Our ski mountaineering clinic provides technical climbing skills to complement your skiing experience.